Casinos are relatively new in Switzerland, although it already has around 20. 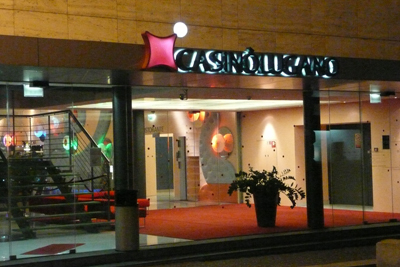 The largest casino in Switzerland is the Casino Lugano, situated in lake-town of Lugano, close to the Italian border. It has 350 gaming machines and 32 table games, including Poker, Blackjack, Baccarat, Roulette and Wheel of Fortune. Switzerland, a land-locked country of Western Europe, is bordered by several other countries: by Germany to the north, Italy to the south, France to the west, and by Austria and Liechtenstein to the east. It covers an area of just under 16,000 square miles (around 41,000 sq. km) and has a population of almost eight million people. Switzerland contains several mountainous areas, which account for 40% of the country's terrain. (Jura and the Alps are its two mountain ranges.) In addition to its mountains, Switzerland contains a variety of landscapes, including hills, forests, open pastures, picturesque villages and several rivers (including the Rhone) and large lakes (including Lake Geneva). Switzerland also contains many interesting towns and cities famed for their culture and architecture. Two of its cities, Geneva and Zurich, are among the world's leading financial centers. Switzerland has four official languages: German (spoken in the north and the main language of almost two-thirds of the population), French (spoken around the west part of the country and the main language of around one-fifth of the population), Italian (spoken in a small area bordering Italy to the south) and Romansh (spoken in the southeast by just 0.5% of the population). Switzerland, which is the world's 4th richest economy by GDP, relies considerably on banking, insurance, engineering and tourism, although today its key sectors are predominantly industrial. Principal Swiss exports are pharmaceutical and medicinal products, special machinery, precision instruments, clocks and watches, and metalworking machinery and tools. Many major multinationals operate in Switzerland, while its own largest companies include Nestlé, Swatch, Novartis, UBS, Credit Suisse and Swiss Re. Swiss cuisine varies considerably across the country, due to its many different cultures and climates, although key ingredients common to most areas are dairy products, bread and cheese. Switzerland is indeed famous for its cheese, as well as for its chocolate. Dishes seen across the country include 'fondue' (bread dipped into melted cheese served in a large pot), 'rösti' (a deep pancake made of grated potato and to which various herbs, bacon, onion, cheese, etc. may be added) and 'raclette' (a dish of melted cheese scraped from a large chunk and accompanied by potatoes, ham, onions, etc.) Swiss desserts include deep-fried apple cookie, cinnamon cookies, nut cake and carrot cake. Sitting at the crossroads of several cultures and languages, Switzerland has a highly diverse cultural landscape. As with most countries, it has its own particular kind of folk music with yodeling (whose roots go back to the early Stone Age and is encountered in other countries too) and the Alpine horn (whose origins lie in northern Asia) being two of its most famous elements. Versions of the dulcimer, accordion and harp are also used in traditional Swiss folk music. Switzerland hosts several music festivals, especially during the summer (including jazz, pop and rock), which cater for a wide range of tastes. While the Swiss movie industry has never been dominant, the 1970s saw the emergence of prolific director Jean-Luc Godard (born in France but to parents of French Swiss descent). Famous Swiss people (recent and now) include tennis players Roger Federer and Martina Hingis, actress Ursula Andress, world champion figure skater Denise Biellmann, musician/performer René Naumann ('DJ Bobo') and H. R. Giger (artist, illustrator and sculptor who designed creatures and sets for the movie 'Alien').